Saudi Arabia, December 04, 2018: Al Jazira Paints has opened a new production line called 'Making Joy', coinciding with the International Children's Day. 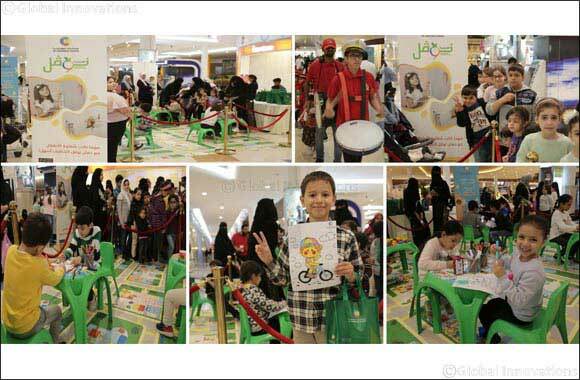 The company has recently enabled hundreds of children to work together with KIDSDOM for two consecutive days at Al Hayat Mall in Riyadh on the impact of rain showers in the capital.' 'We always strive to draw a smile on the lips of our children, male and female, and bring pleasure to their hearts. We saw on the International Children's Day a beautiful occasion to express our love and affection for our small buds and their happiness, ' said Abdullah bin Saud Al Rumaih , CEO of Al Jazeera Paints. and to provide in- kind gifts and free tickets for them to enter the 'Kidzdom', and enjoy the various games available, which has already been achieved, where many of them have faced rich experiences as doctors, nurses, firefighters and paramedics, As well as learning culinary arts, beauty arts, and other games, which develop the child's perceptions, expand his thinking areas, and gain new skills. He added :'Through the large numbers of children and their families who have interacted with us and come to live the experience, we recognize the importance of the' joy industry And that we are doing our duty and our social responsibility as a national leader for our children, today's generation & men of the future. He continued 'We have been the first paint company to produce a special paint for children's rooms and the first paint company that allows visitors to their showrooms in and outside the Kingdom to learn about realistic models of children's rooms, colors and furniture . As well as the first paint company to launch a website for children, and to take an opportunity in various events and activities to express the extent of attention to children at Al Jazeera Paints, and it was a good occasion to introduce the family, especially the mothers, to our unique product, Al Jazeera Novel , and the ease to wish and clean if it is destroyed by the children at home .